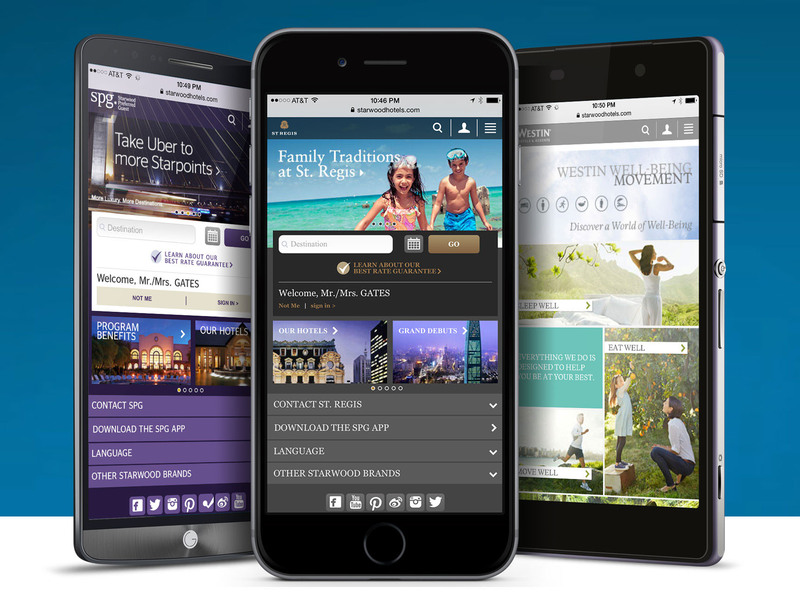 My team and I worked for over a year to completely re-design the mobile websites for all nine of their global hotel brands including Westin, Sheraton, St. Regis, The Luxury Collection and W Hotels. 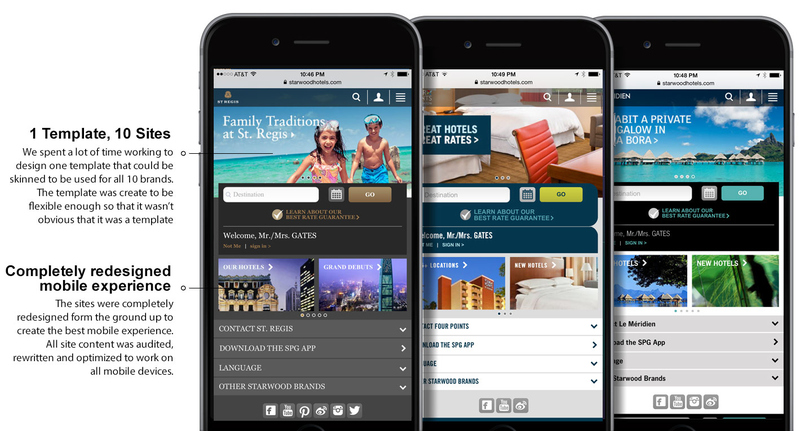 The challenge was to bring all the functionality and branding of the full desktop search and booking experience to a mobile device. This process was difficult because it required a huge amount of work to simplify the search and booking processes for this new form factor. The design challenge was to create a new template system that could be re-used across all nine brands so all the sites could be launched at while but needed to be flexible enough so the experiences where differentiated and just as brand enhancing as their desktop counterparts. One of the greatest challenges with this project was that since we had to re-design all nine branded sites it meant that we needed to find efficiencies through the use of templates to be able to launch all the sites within the project timelines. But we didn’t want to use simple templates where the personality and content of each brand would be diluted and so we spent a lot of time working to create templates that could be visually strong and unique. The final result was a template that we could skin using different colors, fonts, photos and content to make them each appear unique even when we did something guests never would do and line them up all side by side. One of the things we have learned is to really pay attention to global usability patterns as you will find that not every culture uses the same device the same way. 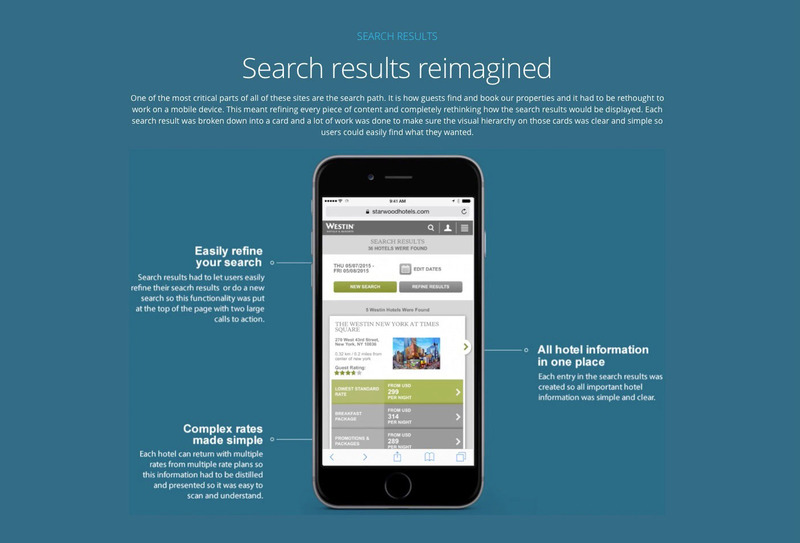 For instance our search flow is very different in several foregone markets, especially Asia, where we see guests are much more like to arrive at a destination without a hotel booked. This means that there is a much higher need for ‘near me’ same day searches and as a result you will see that the search flow for those languages reflects that usage behavior. 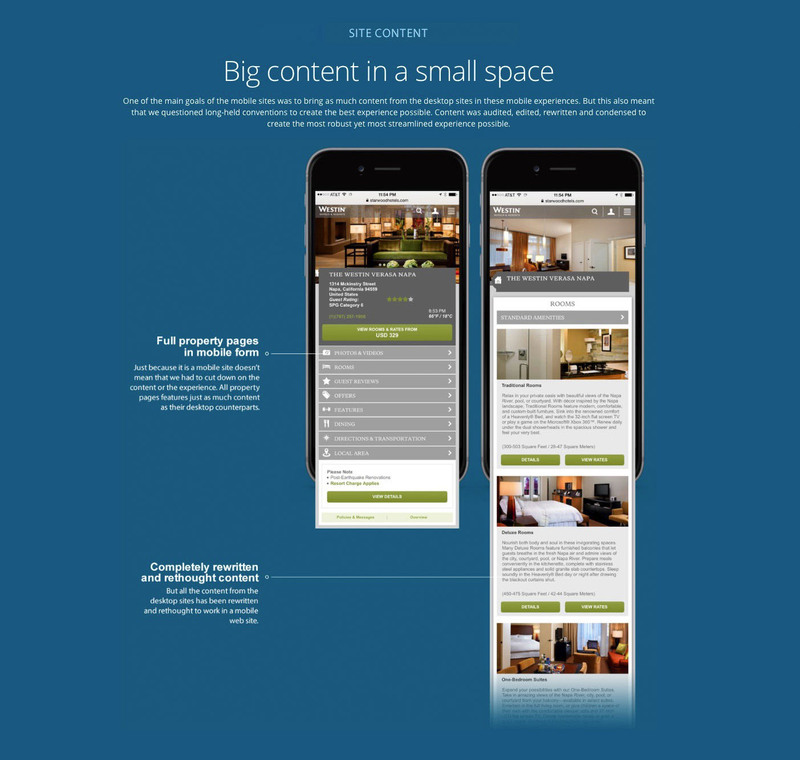 Bringing branding into the mobile world has always been extremely difficult. 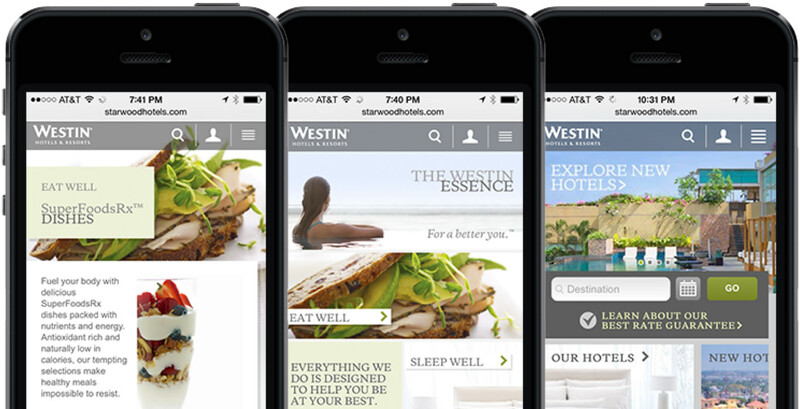 Branded experiences need photos, videos and unique typefaces while mobile design demands simplicity, speed and focus. So designed the brand essence sections of each of Starwood’s nine brands was a real challenge that took a lot of thought as here again we needed to create one template that could work for all nine brands. The final result was a highly visual solution that let the visual language of each brand shine through and as the user went deeper into the experience more content was revealed to immerse them in the brand and its programming. In addition to creating 10 mobile web sites, we also launched with sites in 9 different languages. This meant more than just translating content but also making cultural usability changes to the sites for guests in Russia and Asia who heavily favor same day searched would have a different search experience than guests in Europe and America. The sites were launched in English, Deutsch, Russian, French, Italian, Chinese, Japanese, Spanish and Portuguese.